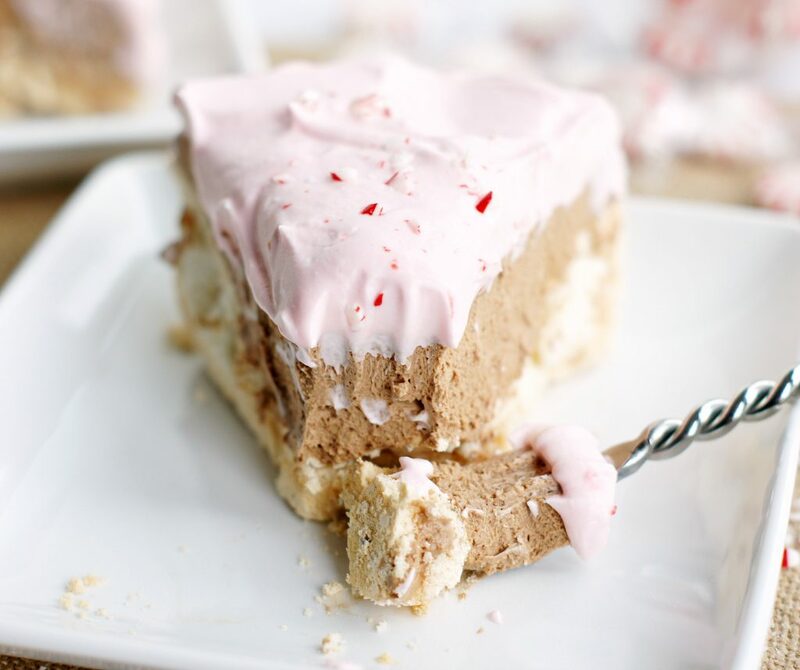 On the 10th Day of Sugar my true love gave to me Chocolate Mousse Peppermint Pie . . . after all, tis the season for peppermint, right? The 12 Days of Sugar is winding down and that’s probably a good thing because even I am getting a little sugared out. 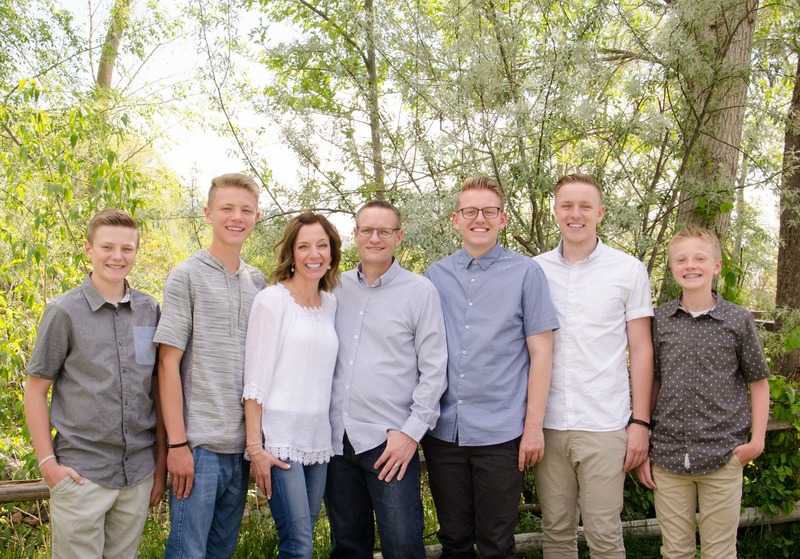 It’s a really good thing that my father-in-law is our dentist because after all the sugar we’ve eaten, there may be some cavities involved ;). One of our all-time favorite desserts is this chocolate mousse pie. We’ve been known to devour an entire pie in 53.8 seconds flat. 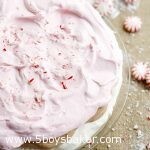 I decided to give it a holiday twist and top it off with peppermint whipped cream. Best. Decision. Ever. We inhaled it! 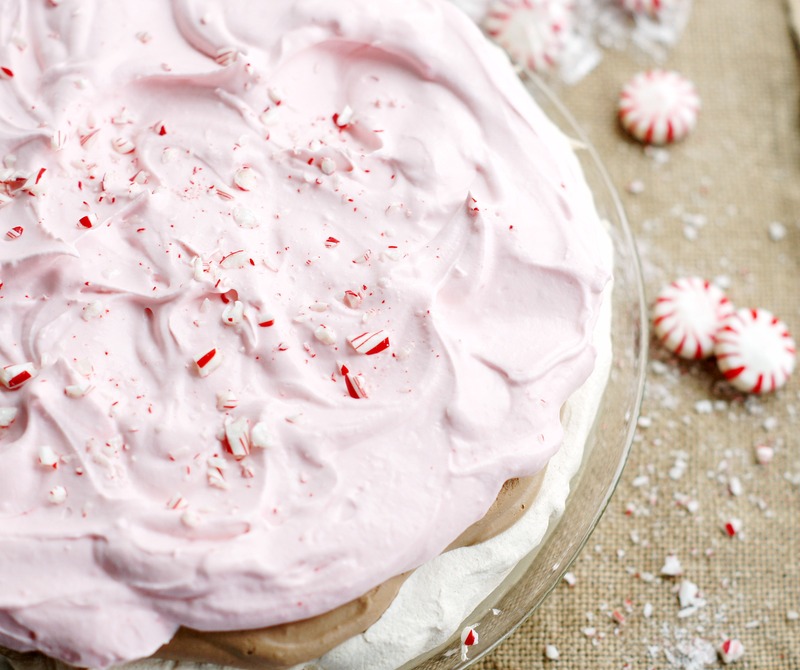 It just melts in your mouth and the peppermint whipped cream is out of this world. It’s a meringue crust (by the way, whoever invented meringue crusts was brilliant) filled with a smooth, rich chocolate mousse and then topped off with peppermint whipped cream! It’s amazing and I must admit, the crust is my favorite part of this dessert! It’s light, but decadent and literally melts in your mouth. In addition to being just crazy delicious, this dessert is gluten free which is an added bonus! This is one of those show-stopper desserts. It’s perfect for your holiday table this year or any time want to knock the socks of your guests. It’s best if made the night before up to the mousse layer, but if you lack brain cells like me, and sometimes forget to make the dessert the night before, just make sure it chills at least 4-5 hours before. Butter one 9-inch pie plate. Set aside. Place egg whites in a large mixing bowl, beat with electric mixer until stiff peaks form. Slowly add in the sugar, vanilla and vinegar. Continue mixing until sugar has dissolved and eggs form soft peaks. Pour into buttered pie plate. Bake at 300 degrees for 40-50 minutes. Turn off oven and allow to cool in oven. In small sauce pan, melt chocolate and evaporated milk over low heat. Stir until smooth and chocolate is completely melted. Remove from heat and stir in vanilla. Allow to cool. While chocolate is cooling, whip 1 cup whipping cream and powdered sugar together in a large mixing bowl. Fold in crushed peppermint candy until well combined. Fold cooled chocolate mixture into the whipped cream. Allow to chill several hours (at least 5 hours) or preferably overnight in the fridge. An hour or so before serving, whip 1 cup whipping cream and powdered sugar until stiff peaks form. Fold in crushed peppermint candy. Spread over chocolate mousse. Store in refrigerator. Best if eaten within a day or two. Make sure you plan ahead because this pie needs to chill for several hours or preferably overnight. Haha, thanks Terri for catching that. Hope you enjoy this.